We very nearly didn’t make it. Three Welsh girls and an Aussie hire car is a potential recipe for disaster, but we sped across the bridge to the Phillip Island Nature Reserve in the nick of time. We were here to witness the famed Penguin Parade, an incredible spectacle performed at sunset every evening by the island’s colony of Fairy Penguins as they return to shore following a day of ocean fishing. “It’s bloody Baltic outchyear” said one my companions as we hunched up and rubbed our hands together to keep warm on the tiered seating facing out towards the South Australian sea. It is not always tropically hot and sunny in Victoria, Australia, particularly in winter at twilight with an antarctic feeling wind whipping around your face. We had been instructed to remain as quiet as possible. Photography and filming are also strictly forbidden, because the little penguins are easily frightened. And so we waited as quietly as we could, everyone scanning the seas for that first exciting glimpse. Eventually a few little bodies emerged in the break waters. One, two, five, ten, accompanied by a collective intake of breath and an exhalation of ‘ahhhhh”. Before a huge crashing ocean they are extraordinarily tiny. The Fairy or Little Penguin (sometimes also Little Blue Penguin due to its grey-blue plumage) is the smallest species of penguin in the world. They grow to only about 33cm and they can be found in only a few locations: Australia, New Zealand and reportedly also in Chile. Probably unaware that they held an audience so captivated but clearly very wary, they took a little bit of time before they felt brave enough to make a run for it. All of a sudden off they went. Just as suddenly they had second thoughts and hastily retreated back to the safety of the sea to regroup and have another think about it. By this time more were emerging and ganging together, until safety in numbers gave them the confidence to have another go. 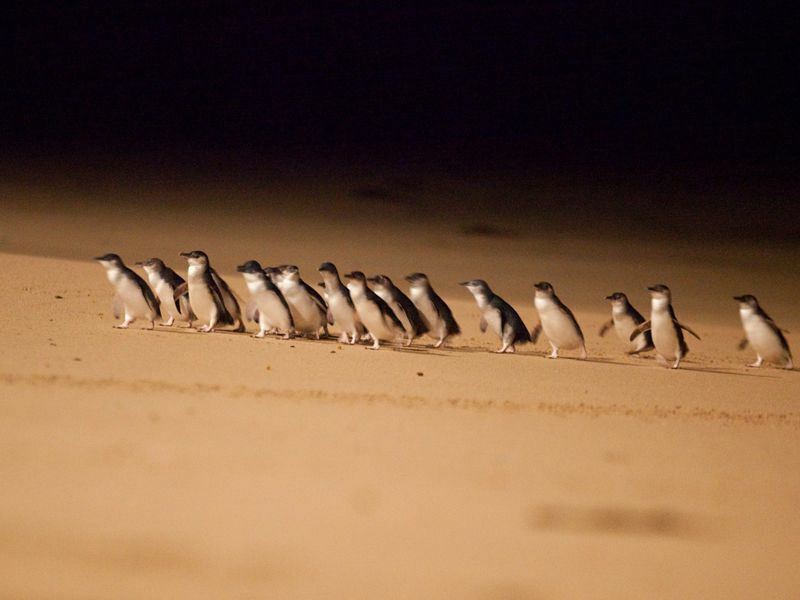 Slowly but surely more and more miniscule little penguins sprung up from the waves and made their way up the beach, until there were hundreds all hurriedly waddling and wobbling up the sands and towards their burrows between the boardwalks and the dunes. It is an amazing sight. They just kept coming, more and more popping out of the waves. 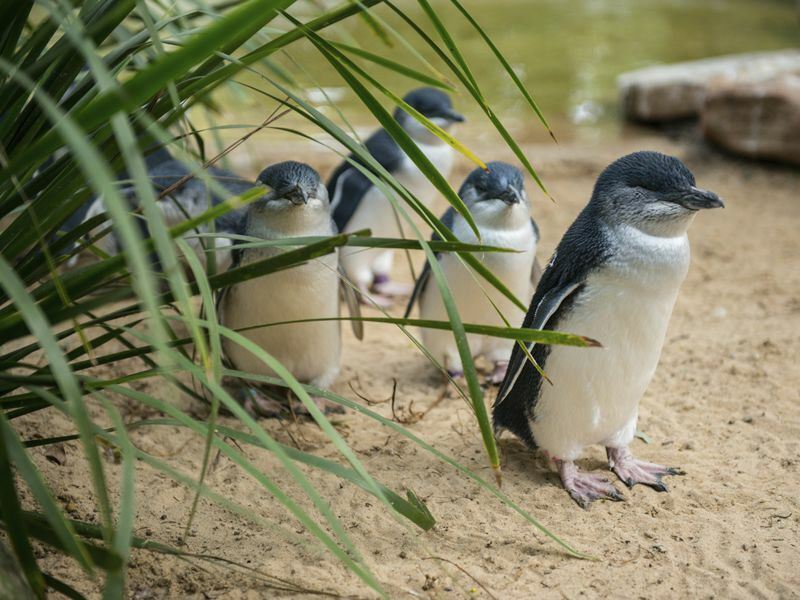 Phillip Island is home to around 32,000 Little Penguins. We did not see as many as that, but there certainly were a lot. Until the last stragglers eventually made it and hurried to catch up, we were transfixed. Whilst you are awaiting the arrival of the penguins, or when the excitement is all over, there is an excellent visitor centre where you can learn all about the penguins and the important research that your entrance fee facilitates, as well as how else you can assist the Penguin Foundation. For example, you could adopt a penguin if you want to. Although this does not mean you can take it home with you however much you might want to! As plentiful as the penguin population seems to be, it has been effected by a variety of environmental and ecological factors. The foundation helps raise money for vital research and conservation so the penguins can continue their parade for years to come. The island they call Phillip also boasts a plethora of other interesting and wildlife-orientated activities, so you need not chase the sun like we did. Instead spend a leisurely day. Fur Seals, Koalas and surf beaches are to name but a few. But entirely unique and unmissable is the Penguin Parade. It is a privilege to witness one of nature’s most enchanting displays. I can quite see why it is one of Australia’s top attractions and a bucket list favourite.